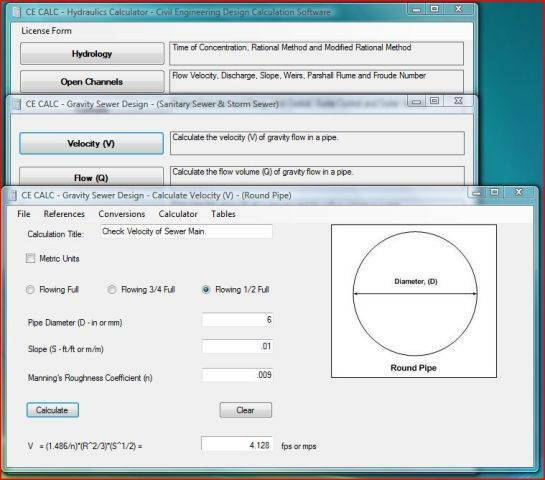 Stand alone software version of the hydraulic calculation portion of the CE CALC website. Runs on the Windows . NET platform. Performs civil engineering calculations for hydrology, open channels, culverts, gravity sewer, transmission lines and unit conversions. 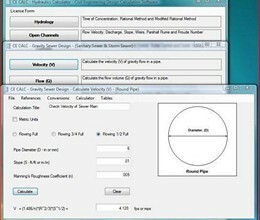 * Hydraulic Calculator download link provides trial version of the software. Performs civil engineering calculations for hydrology, open channels, culverts, gravity sewer, transmission lines, traffic/road geometry, surveying/earthwork, pavement, concrete floors and unit conversions. Performs civil engineering calculations for traffic/road geometry, surveying/earthwork, pavement, concrete floors and unit conversions. CalcPad is a professional software for mathematical and engineering calculations. It represents a flexible and modern programmable calculator. This application can be used to make quick parameters calculations of beams and reinforced concrete slab not only in the office but also at the construction site. PTC Mathcad is the industry standard software for solving, analyzing, and sharing your most vital engineering calculations. No comments yet. Be the first to comment. Hydraulic Calculator has been rated 4.5 out of 5 points. A total of 4 votes cast and 0 users reviewed the software. This software is a complete hydrology package included as a number of separate executable files. Implementation of the familiar Hardy-Cross pipe distribution algorithm. Pipe Flow Expert is designed to help todays engineers analyze and solve a wide range of problems where the flow and pressure loss throughout a pipe network must be determined. EPANET is software that models water distribution piping systems. EPANET is public domain software that may be freely copied and distributed. Flow Advisor can be used to estimate water flow rates from various open channels, closed channels and differently shaped supply tanks. Statistical Software Package (HEC-SSP) developed by the Hydrologic Engineering Center. This software allows you to perform statistical analyses of hydrologic data. Giswater connects water simulation programs to a powerful GIS interface, and lays the foundation for full management of water supply systems, sewerage systems, drainage networks and rivers. The versatile software for site design, water distribution system, drainage, stream hydrology in infrastructure development projects. All software and resources in the CESDb.com directory are property of their respective authors. All downloadable or viewable content available on CESDb.com is provided as-is. You agree that you bear sole responsibility for your own decisions to download or use any of the software listed.